Got a forwarded email this morning and I was kinda shock to see this restaurant serving food in a comfort room like style. I am not sure if this is in China or Japan though. 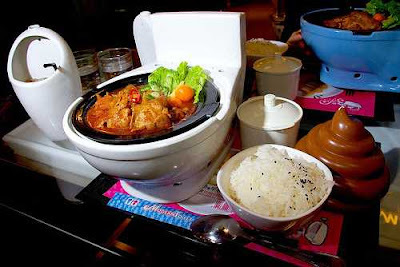 Imagine serving your food placed in a bowl that looks like a sanitary bowl?... awww yuck! I don't think I can eat my food placed in a thing like that, I'm sure I will loose my appetite and with kind of ambiance it's not conducive for a sumptuous lunch or dinner. Sometimes people are crazy ,very innovative and very adventurous. Would you dare eat there?? ?